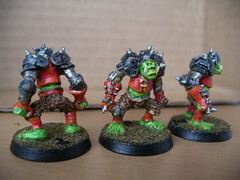 Blood Bowl is a version of football/rugby played with fantasy races from the Warhammer universe (like Orcs and Chaos). The only way to score is by touchdown (i.e. no field goals), though you can accomplish this with a quick fragile team dodging blows and racing down the field to catch long bombs... or with a tough plodding team bashing opponents to death and trotting into the end zone after you opponent's team is left writhing on the field... or something in between. It's designed as a humorous parody... not a serious sports sim... so you get little goblins with giant chainsaws and dwarfs driving spiked steam rollers. You can cheat by kicking down players when the ref isn't looking, using performance enhancing potions, or bribing the ref or your opponent's players (some of this depends on the game mode you choose). All in all some good clean fun. The rules for the actual table top game are located in PDF form here. If you've never played Blood Bowl, I highly recommend checking them out because the tutorials don't really get into the underlying mechanics very much and it can make a huge difference in understanding what's going on and what you should be trying to do. Also, for FUMBBL players... Blood Bowl uses LR5, not LR 4 like FUMBBL, so you might want to familiarize yourself with the changes, since from what I understand some standard builds don't make as much sense now. Also note that the game comes with a strategy guide in the "goodies" folder, but here is a great strategy guide as forum post... with links to individual race strategies and builds. For either single or multiplayer, you build a team with a set amount of cash from one of the 8 available races. Each of the races has different types of players which cost different amounts, are allowed in certain quantities, and have different abilities available... though there are some common types, like Lineman or Blitzers, that you'll find on several races' teams(though still with different abilities and skills). You can have up to 16 players, but only 11 max will ever be on the field at one time, and so the rest are for injury insurance(a very good idea for all but the heaviest teams!) or for offensive/defensive substitutions (mainly practiced by the versatile human teams, as I understand it). You also spend that starting money on how many re-rolls during a match you get, an apothecary who can try and save your injured (or even dead) players, and cheerleaders(haven't seemed that useful... can get you extra rerolls in certain situations but I think that's it). You can increase those things later, after earning more cash, but some might be cheaper initially based on team (not sure about that). Since I've only played the Campaign mode with turn based action and a human team (starting over twice), that's what I'll focus on. As I mentioned above, the tutorials aren't super great... they're fine and can get you out there playing... even winning... but a lot of results will seem incomprehensible or unfair, when they're obvious if you understand the basic mechanics. That was what most of the games I played this weekend were like, after getting crushed a lot early, I did develop a feel for what my players could do... and could win games... but nothing ever clicked until I read the rules and then restarted my team. It may be that you have to do that sort of thing regardless... that the rules will seem like gibberish before you actually see it play... but now, after probably a dozen games, I'm starting to feel like I get the tactics. There's a learning curve is what I'm saying. Personally, I advise learning what tackle zones are... how nearby players can assist in a block... and how you can neutralize those assisting players. That's the major thing that's helped me understand the underlying tactical game that, as I "get" it, really seems superb. It may be that after I've got some more experience, it won't seem very deep, but based on the fact that people have been playing variants of this game for 30 years... I sort of doubt it... but you never know. Beyond the tactical portion contained in the individual games, you also have the strategic aspect as you grow your players(and replace the dead ones) over the course of a season... in the single player campaign, each season has multiple parts where different tournaments become available, though you can only play in tournaments your team is prestigious enough for. Win tournaments, get more famous, and then play in harder tournaments is how it goes... but as you do this, your players earn points towards a new level where you can learn a new skill RPG style. You only earn points for "big things" like touchdowns, passes, interceptions, causing casualties, or being MVP (completely random, not merit based)... so leveling up a player can take several games. Combine this with how fragile (some) players are and how big a difference skills can make, and even a level 3 player is a badass. One aspect that I like is that it seems that the most fragile players have the easiest time scoring... and thus get points quickly for leveling up... and then become even better at scoring... but this makes them a huge target for the other team, and then one bad roll... SPLAT... your best player gone. That kind of trade-off will affect your tactics in specific games as you decide whether to use players in ways they're not naturally suited to get points to level, even if it is more likely to be disastrous. I don't actually have much to say about either graphics or interface, but felt like I needed more sections. :) The artwork is great, but the graphics won't blow you away by any means... they share a lot with WoW... colorful, cartoony, and plenty of character but not jaw dropping and not everyone's cup of tea. I spend most of my time zoomed out looking at the whole field, so I don't really notice the quirks (positive or negative) much anyway. For the most part I think the interface works, though I've had my problems with it. It's not intuitive, but I don't feel like I'm fighting it... it's just easy to miss things if you don't know where to look. I don't buy strategy and tactics games for graphical excellence, and I'm someone who doesn't care much one way or the other about interface design unless it gets in my way excessively... but YMMV. It should be obvious that I think the game is pretty great, though I've only been playing for a few days(and we all know it can take a while for warts to show up). As someone new to Blood Bowl (though I did love M.U.D.S. back in the day so I might have a soft spot for the genre), I found it a little tough to learn how to play, but still have thoroughly enjoyed it and think I'll get a lot of miles out of the title. One of the big determinants of how long it stays on my playlist is whether or not I get into MP... as I don't have any friends with the title, I'll have to see how I like public leagues playing with randoms (I generally don't), or if I can find a good community source of managed leagues. However, I feel like I'll enjoy leveling up my players and trying new play styles for quite some time, even if I stay in SP. Now, it also appears that there are some problems with the AI... obviously, as a newb playing at Medium difficulty, I'm not really to the point that I've really noticed much "brain dead behavior". I certainly haven't had much trouble losing games at any rate, but we'll see how that develops as I play more. If the game stops being challenging once I've been playing for a week, I may not be so pleased with it. As Tycho says, it may be advisable to wait for a patch or two if you're on the fence after reading all this.